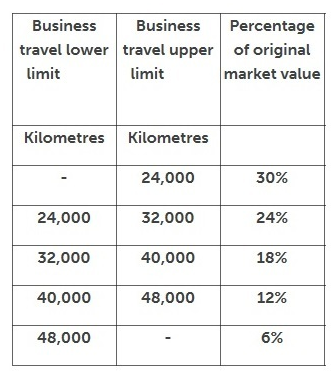 Annual business mileage is defined as total business mileage less a minimum of 8,000 private kms. In line with Revenue regulation, employees should submit periodical mileage records to the employer when an employee is provided with a company car. Cumulative kilometres to date should be adjusted accordingly within the payroll to record an accurate value to the benefit given to the employee. Employees with a company van will pay a set rate of 5% of the Original Market Value of the van regardless of business mileage. To access this utility go to Employees, select the employee in question from the listing and click 'Benefits' on the menu toolbar, followed by 'Vehicle'. 1) Type - indicate whether the vehicle is a car or a van. 2) Description - enter a description of the vehicle e.g. make, model or vehicle registration number. 3) Original Market Value (OMV) - enter the OMV of the car/van. The OMV value of a vehicle is the price (including any duty, VRT or VAT) which the vehicle might reasonably have been expected to fetch, if sold in the State singly in a retail sale in the open market, immediately before the date of its first registration in the State or elsewhere. 4) Carbon Class - once in force, the carbon class will determine the rate of BIK to be applied to new cars purchased after the effective date. Please note, a commencement order indicating the start of this treatment is still pending. Until such time as it has been brought into force, leave the carbon class at "A". 5) Reduction - tick the field provided if the employee qualifies for the reduced rate, due to being away from premises at least 70% of the time, along with other specific requirements. 6) Start Date - enter the date the employee first started using the vehicle in the current tax year. 7) End Date - if the employee returns the vehicle in the current tax year, enter the date of return. 8) Kilometres - to automatically increment the employee's business kms each pay period, enter the average number of kilometres the employee is expected to do each pay period. 9) Employee Contribution - enter any amount made good by the employee directly to the employer towards the cost of providing and running the vehicle. 9) Click Save to save the Benefit In Kind entry. The 'Notional Pay' will be added to the employee's gross income each pay period to ensure that the correct PAYE, Universal Social Charge and PRSI are charged. From 1 January 2018 to 31 December 2018, where an employer provides an employee or director with an electric car or van, no taxable benefit will arise for the employee or director. This exemption is limited to cars or vans which derive their motive power solely from electricity (no exemption is available in respect of hybrid cars or vans). The provision of charging points on site by an employer for the electric charging of vehicles will not give rise to a taxable benefit for the employee or director from 1 January 2018.